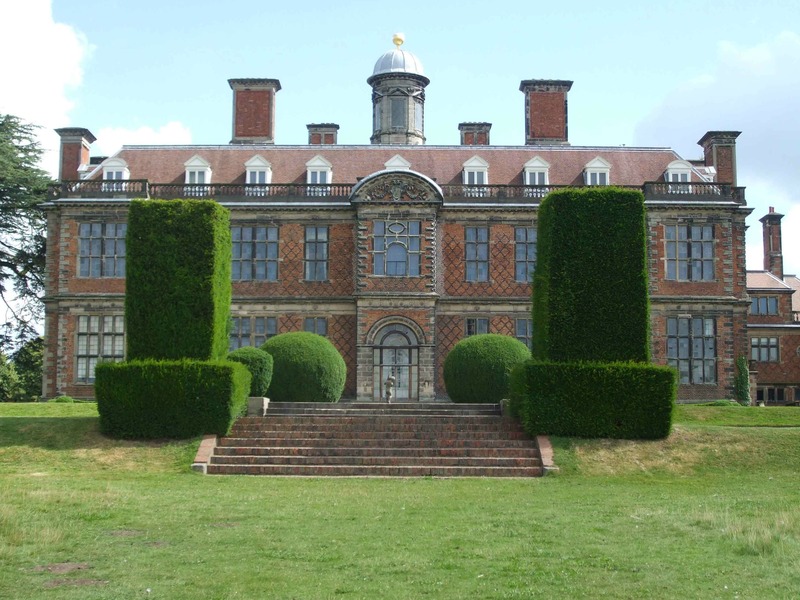 Last Sunday we headed off to visit the stately home of Sudbury Hall in the neighbouring county of Derbyshire. Along with us was our elder daughter, Nicola. Sudbury is located close to Ashbourne on the southern edge of the Peak District National Park. We had quite a clear run (meaning no traffic hold-ups) and it took us about an hour and twenty minutes to get there. We last visited Sudbury in 2003, so we thought it was about time we had a revisit. But this time it wasn’t the Hall itself we wanted to see – although we did have a quick look round – but the adjacent Museum of Childhood, which has been revamped in recent years. To be honest, we couldn’t really remember how the museum was laid out in 2003 so I can’t make comparisons, but it’s an interesting place, with exhibits (mostly toys) dating from the 18th century, but focusing mostly on Victorian times, complete with a Victorian schoolroom. 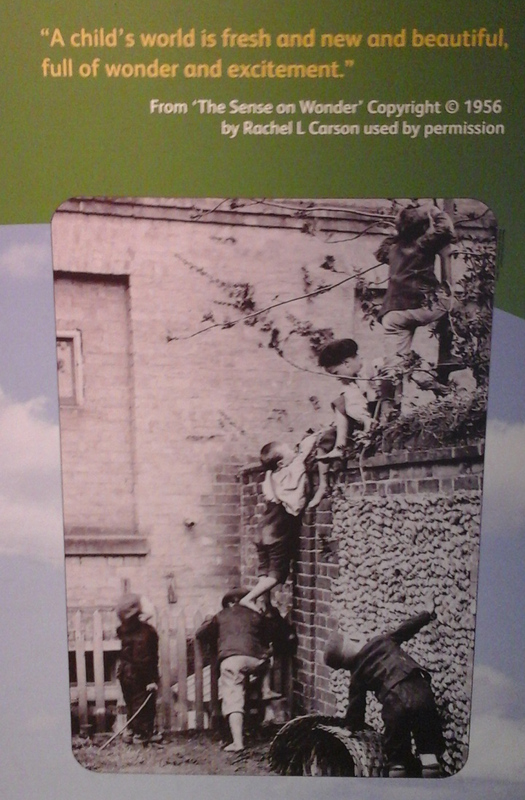 We took far too may photos inside the Museum of Childhood to show here. The exhibits were all inside glass cases, too, and the thick glass with the lights over each display made some of the photos very poor, due to the glare. The toys were all very interesting, and took the three of us down ‘Memory Lane’ for a while: with Nick and I it was the toys from the ’50s and 60s while Nicola reminisced over those from the ’70s and 80s. Many of the Victorian toys were just amusing and some of them very clever, if not particularly suitable for children. There were also gollywogs amongst the soft toys and many dolls. Gollywogs have been a controversial issue for some years now, and I’m not even sure whether they were banned. But I well remember them during my 1950s childhood. In Victorian times, children played with toy horses and traps in the same way as modern children play with toy cars. When the handle is turned, the clown beats the pony and the music starts. Frank Hornby obtained the first patents for his mechanical construction system in 1901. It was last produced in the UK in 1981. Parts of the museum focuses on the lives of some of the poorest Victorian children, and the gruelling jobs they were forced to do to contribute to the family’s meagre earnings. These are a few of the snippets of information about three of the jobs that Victorian children would have done – chimney sweep, pit boy and household maid. Lastly, this poster, which must show somewhere in the US, since Rachel Carson was an American author, took me back to my days of ‘playing out’ with my friends. We weren’t city dwellers, or so poor that I had no shoes, but the idea of groups of us running round and getting into mischief is just the same. I’ve climbed over lots of walls in my time, as well as up many trees. What fun it was! All in all, a lovely day out – and the weather smiled on us, too. Childhood is the best period of everyone’s life! This museum shows its perfectly! Wonderful post, dear Millie! I enjoyed it very much! Childhood is a wonderful time and I had a great one. It’s always good to look back and reminisce and this museum triggered so many memories. Thank you, Ann. I remember Paddington Bear! That’s what first got me to try orange marmalade, back when I was such a picky eater I wouldn’t try *anything* new. We had a kitchen set similar to that, too, although ours was handmade and painted white with black dials. My grandpa made it for my mother when she was young, in the late 1940s/early 1950s (along with the child-sized desk, table chair, and dresser that I had in my room growing up). I had never heard of Gollywogs until this post, or even known that wog is a derogatory term (which I found out by looking up Gollywog on Wikipedia), which is good to know in case I run across it again. I can definitely see why they would be controversial. Yes, the Gollywog issue is a funny one. Enid Blyton’s ‘Noddy’ books (which had delighted young children worldwide for many years) were almost demonised because she had Gollywogs in them. But they were written at a time when they were accepted then simply as soft toys. Modern thinking is very different, and no one can deny how hateful and wrong it is to use terms like wog. I’m glad you learned something new from my post today, Joy. Thanks for reading it! I always learn something new from your posts, Millie! This one is an amazing post Millie… Thank you for taking us on this tour. I feel pity for poor Kids who had to work so hard… even the ad specifies minimal wage. We live in a better world, I guess! What a brilliant idea for a museum. Adding it to my to-do list. Like me, I’m sure you’d enjoy a trip down Memory Lane, Peggy. The museum is set out well, too. It’s in a building attached to Sudbury Hall (so really belonging to it) and the exhibits aren’t packed too closely you can’t make them out. We went to another Toy Museum last year, where they had literally hundreds of toys from all periods and of all types, all so close together it was difficult to take them all in. (I’ll post about that one sometime). Your ‘to-do’ list must be as long as mine – or perhaps longer! It is a beautiful house. We have seen old toy exhibits in various museums, but never a whole museum devoted to them. I especially love those little mechanical, moving figures. We saw a nice collection of them in Baltimore a few years back. I could watch them for hours. The little mechanical figures are so Victorian, aren’t they? They seemed to have a fascination with clockwork at that time. You’re right, most of them are very clever. Thank, Dinata. Another interesting post, Millie. I find old toys a little bit creepy, but fascinating because of the history they hold. Such a wonderful museum! Thanks, Inese. I find some of the old Victorian toys really creepy. They’re the sort of things they show in ghost stories set at that time. It’s the clockwork things I find particularly disturbing. I suppose it’s just because they move. Such an interesting post 🙂 I was just talking about replacing my Pooh Bear…I gave it to a nephew years ago. Very cool! I’d love to visit a childhood museum and see all the strange “ye olde” toys and also toys from when I was little. Another cool place Millie! My daughter really enjoyed the photos of the toys. wonderful post and pics! So very lovely and thanks for the bit of history. I’m very fond of those old Victorian and Edwardian times! Loved the toys and the vintage image. oh my! gollywogs!! Thank you! I love those periods, too, and haven’t ruled either out for a future book. As for gollywogs, I had several when I was little, but didn’t know what they represented at that age. I loved my gollywogs, and I’m sure my mum didn’t see them as racist or anything. Now, of course, most people do and there are very few around – most being in museums, like this one. so sorry for the late response. Grueling move! Pop by anytime! I’m trying to catch up now! Hello again! I hope you still have all your hair, Cybele! It sounds as though things got a bit rough on the move. I’m sorry to hear that – but things can only get better, now you’re there. I’ve been really busy, too, and we lost our Internet in the middle of this week, so I’m playing catch up, too. I certainly intend to read more of your stories. Lovely to hear from you! Take care. I’m more grey now! lol. still much to do and boxes on the deck to unpack!! But I’m here and it’s lovely. Will post a few pics soon! I hope to read more from you as well!! I just popped over to say hi to Louise! this is lovely…how nice to visit such a museum and be reminded of childhood toys and games….and the grounds were so well kept….i do so enjoy visiting these places through your eyes and thoughts….like i was there.